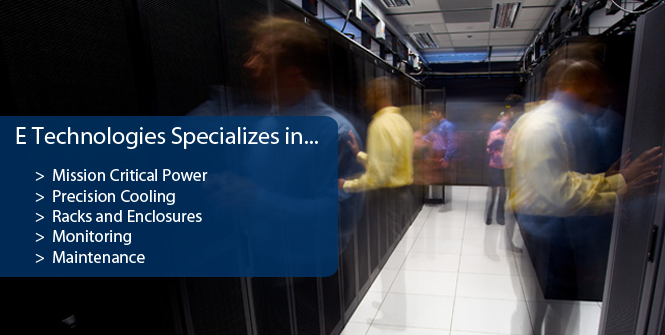 About Us - E Technologies, Inc.
E Technologies is a Manufacturer’s Representative and Integrator of power, cooling, racks, monitoring, and maintenance for mission critical facilities. Our engineers, and account managers are trained to deliver product and application expertise by analyzing our client's unique needs for reliability, efficiency, and life-cycle cost. Whether you need to build a new data center, expand or upgrade an existing facility, or just add a few new racks or systems, we can help. Because of the pivotal role we play, E Technologies is committed to creating and maintaining powerful customer relationships built on a foundation of competence and trust. From the industry leading products we furnish to our customer service and support, we know what’s important to you and we work hard to deliver. Our mission is to be our customers' best supplier of mission critical facility support products and services, to help our manufacturer partners achieve their objectives, and to provide challenging and rewarding opportunities for our associates.